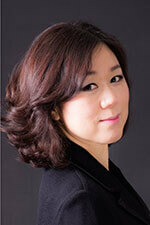 Eunmi Moon holds degrees from Seoul National University, The Juilliard School, and Teachers College at Columbia. She has appeared as a guest collaborative artist at such venues as Alice Tully’s Wednesday at One and An Evening Of Chamber Music series, the Trinity’s Noonday Recital Series in New York, The Matinee Musicale series in Ohio, Artist International Winners series in New York, The Naumburg Winner’s Concert series, Sunday Concert series at Stewart Gardener Museum, Philadelphia Chamber Music Society at Philadelphia Convention Center, The Pro-Mozart Society of Atlanta, as well as countless community, public library, and museum concert series. She has also performed in other countries such as Korea, Japan, France, Austria, Switzerland, Norway, Argentina, Mexico, Guatemala and Puerto Rico. She was a vocal coach at Juilliard Opera Center and Manhattan School of Music, and taught piano at Teachers College, Columbia University.